On Thursday the Social Security Administration (SSA) announced a new policy where claimants and their attorneys would not be provided the name of their Administrative Law Judge (ALJ) assigned to hear disability cases. My knee jerk reaction was that this is the worst thing ever and that its time to fire up the torches and camp out on the palatial Social Security grounds in Falls Church, VA but that is not where I am today. Let me explain. The most told rationale about the change is that attorney and representatives are withdrawing from claimant cases at the National Hearing Center when the case is assigned to an ALJ who does not have a history of paying claimant’s cases. The National Hearing Centers are an attempt by Social Security to move claims for Supplemental Security income (SSI) or Social Security Disability Income (SSDI) along more quickly. Judges at the Hearing Centers conduct hearing via Video Teleconference and never come face to face with the person about whom they are making a decision. This filter of video and interest simply does not allow for the same type of communication when people are in the same room. In effect a video hearing is a decision to give up human interaction in favor of speed. To that end, attorneys want to protect their clients will be inclined to only have a haring with a judge that is going to be more receptive to claimants. As these cases are taken on a contingency basis financial survival for the claimant and the attorney depend upon winning. There are times when a case just does not develop as the attorney hopes between meeting with the claimant and it becomes clear that the proof does not exist to obtain SSI or SSDI benefits. In those cases the ethical rules that bound us as attorneys requires us to speak with the claim, inform them of the situation and let them make the decision whether to proceed with the claim. When appropriate I will recommend that we withdraw the application, but to withdraw from the case at the 11th hour due to the judge assignment is infuriating to me as an attorney. This obligation to fully and skillfully represent clients exists in all circumstances where attorneys are involved exists whether or not a contingency fee agreement exists. To SSA, lawyers withdrawing from Disability Cases is increasing the inefficiency at the inherently in efficient National Hearing Center and this “blind scheduling” is a remedy for that problem. What is not addressed is the number of judges who deny excessive numbers of cases—cases where the individual has clearly debilitating health conditions, the ALJ denies the claim, and when the case is appealed to the Appeals Council or to the Federal District Court the ALJ decision is sent back to consider all the evidence or benefits are approved are outright approved. The individuals who are “gaming” the system, receiving disability benefits and also working full time under the table, are the cases that are first cited to by Social Security opponents. However, the plight of those that need benefits and cannot get them does not receive the same outrage. People throughout the nation and specifically in Kentucky are reliant upon Social Security Benefits to meet life’s basic needs. 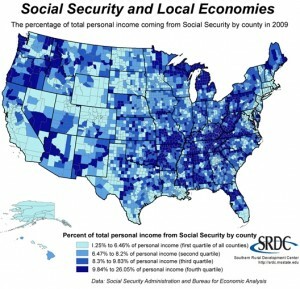 This map represents the percentage of income Social Security makes in each county in the United States. In the area where I represent claimants the following counties have over 9% of their County income: Nicholas, Robertson, Fleming, Bath, Lewis, and Mercer. The rest of my service are (except for Fayette, Woodford and Scott counties) have payment rates in excess of 8.3%. A LOT OF AMERICANS ARE DEPENDENT UPON THIS PROGRAM!!!!!!!!!!!!!!! A good advocate knows the Judge and the client. A good advocate prepares the claimant’s case so that what the advocate has observed when appearing before the judge has been addressed. A good advocate can tell his or her client that the person who will play a large role in their future will be male or female, what special questions the judge will likely ask, and how the hearing process will flow. Due to the actions of others the information I have gathered over the years and used to befit my client is not rendered useless. But what worries me most is when I have a hearing with an ALJ who is aggravated by the mere existence of my client, standoffish, and ready to pick a fight with me or the claimant (Yes Virginia, they do exist!) I will not have been able to prepare myself or the claimant for the 45 minutes of hell which they are about to suffer. Having had the privilege of having multiple clients threaten suicide after contentious hearings this is a particularly sensitive issue. It is my guess that this policy will be short lived as it is bound to decrease the efficiency of SSA in processing claimant hearings. It is also an excellent opportunity for SSA to realize that most of the attorneys who appear really are providing a service to the claimant—and to the Social Security Administration. Special Thanks to Southern Rural Development Center and DailyYonder.com for the county specific information.